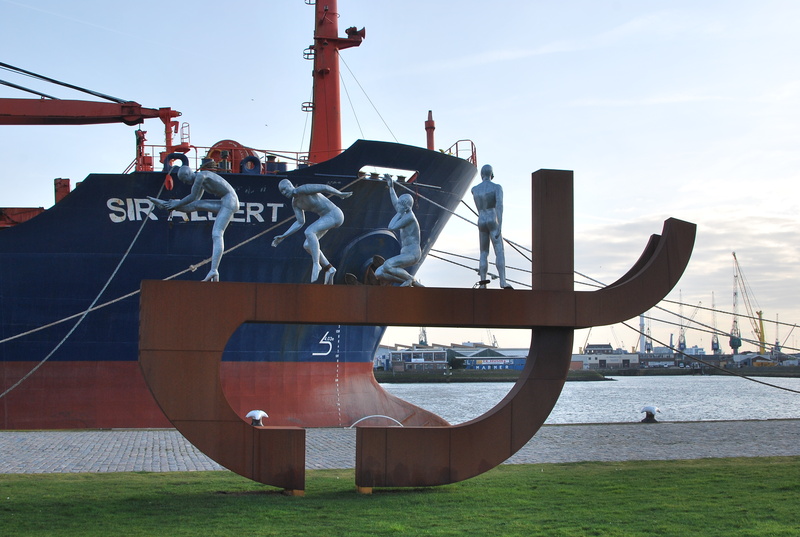 Clave stands in a prominent place in the Lloydkwartier, right on the river Maas and visible to all passing river traffic. The monument is a newcomer to Rotterdam. It was unveiled in June 2013, a fortnight before the national commemoration of 150 years since the abolition of slavery in Surinam and the Antilles in the Dutch Caribbean. The artist, Alex da Silva, is a graduate of the Willem de Kooning Academy and a Rotterdammer with strong links to Cape Verde. Clave is the rhythmic pattern that is the basis for all Latin music. (Short explanation here.) It is also the Spanish word for ‘key’ and tantalizingly close to ‘esclave,’ the French word for slave. 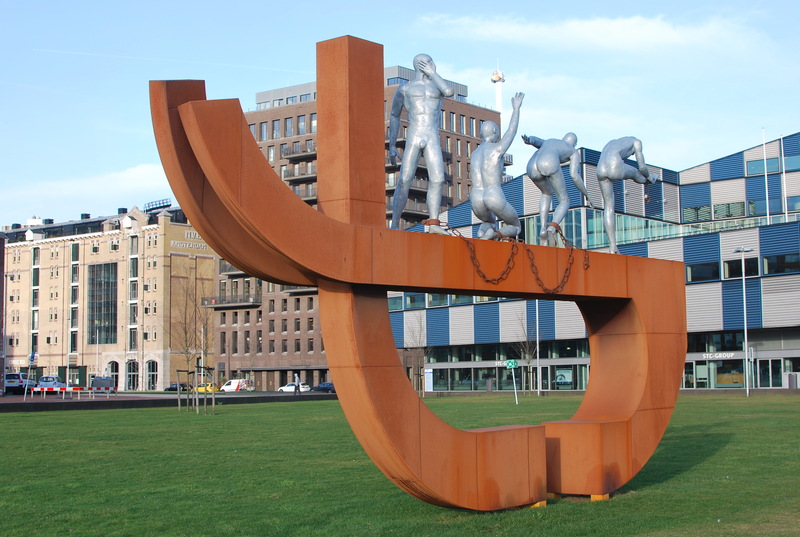 I read that da Silva found inspiration for the monument when he watched dancers practice near his studio in Rotterdam. Perhaps the monument captures the moment of freedom, when the chains were literally cut, and the people were given the basic key to starting their personal journeys, their freedom. There are more than 100,000 people in Rotterdam who have strong personal links to Surinam, the Antilles and Cape Verde, all areas with a history of slavery. If that number is correct, it’s a sizeable chunk of a city with a population of around 615,000! Today, the Lloydkwartier is the new heart of “creative energy” in Rotterdam, complete with a former power plant used by entrepreneurs and artists in the audiovisual, film and ICT industries. The Shipping and Transport College is perhaps one of the strongest reminders of the area’s past as the departure point for ships sailing to the east. The monument to slavery is perched between these two worlds. On the one hand, a reminder of the past that shaped Rotterdam into a wealthy city, but also a strong expression of the creative energy that the Lloydkwartier aspires to for the future. These two photos were taken at different times of the year and in completely different light. I still have not managed to get a photograph that I am completely satisfied with, but I’ll keep trying. Late afternoon sunlight in winter seems to be the most evocative, but it is easy to miss the narrow window of opportunity for afternoon sun in the Rotterdam winter. The first (winter, I guess) photo is great, but pity about the ship. The figure on the right looks great against the sky. This made me think about how, even subliminally, art and sculpture can work on the mind and imagination. Just knowing what it is about makes you pause for thought. I liked the ship. Thought it was a good juxtaposition with the stylised slave ship.